The data board is the heart of the sensors architecure, powered by an ARM M0+ 32-bits at 48Mhz running the Smart Citizen 2.0 software, combining the low power consumption of the ARM M0 family with the power of a 32-bits processor with 32KB of RAM and 256KB FLASH memory. That offers enough program storage and memory space to support multiple auxiliary sensors and no expense. It also includes a Wi-Fi module, a micro SD card slot, an internal Flash and a battery management solution all on a single board. The ARM M0+ is a SAM D21 from Atmel with 32kB RAM and 256 kB of program memory, operating at 3.3V. It is the same chip used by the Arduino Zero and MKR boards. It also includes 4MB of extra Flash Memory for offline data storage. 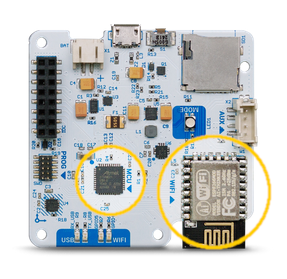 The Wi-Fi Module is the well known Espressif ESP8266 IEEE 802.11 b/g/n Wi-Fi with 4MB Internal Flash for web content storage. 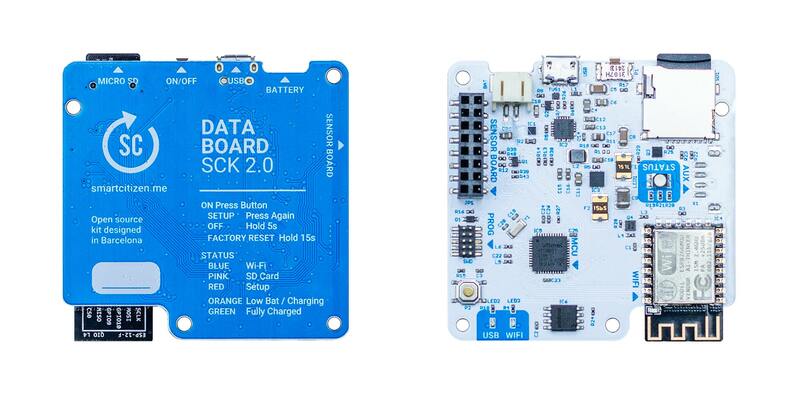 The Data Board connects to the sensor board providing power, analog and digital communications (12 bits ADC, GPIO, I2C, I2S, VCC). Moreover, it includes a Seeed Studio standard Grove connector where off the shelf modules from the same manufacturer can be connected. The external add-ons can be enabled or disabled from the board to save power. The connector supports an independent I2C bus by default, but it can be configured in software to support other uses (GPIO, I2C and UART). The Smart Citizen Gas and Smart Citizen PM sensor boards described above use this bus receive power and communications from the board. The board includes a battery management controller with a 2000mAh Lithium polymer cell capable of powering the device in standby for more than two weeks. On a normal operation, the battery will last for more than a week to one day, when all the sensors are enabled and recording every minute. The controller allows the batteries to be easily charged using the boards micro USB connector using any standard USB power adapter like the ones used on Smartphones. On remote areas, it can also be powered using a selection of PV Panels like Voltaics Systems 6W panel. Blue soft pulsing >> wifi. Pink soft pulsing >> sdcard. Other color + Orange soft pulsing >> on battery. Other color + Green soft pulsing >> battery charging. The firmware is built using the Arduino Zero with a custom variant for the Data Board main MCU. The ESP is also built using the Arduino ESP Core. Both firmwares are built and managed with Platform IO, an open-source IDE for embedded development. Platform IO features built-in dependency management and allows you to compile and upload both processors with a single command. Using the SWD ARM connector you can change the MCU bootloader and debug the firmware using Open Source tools. Learn more about the software running inside the Data Board on the Firmware section. 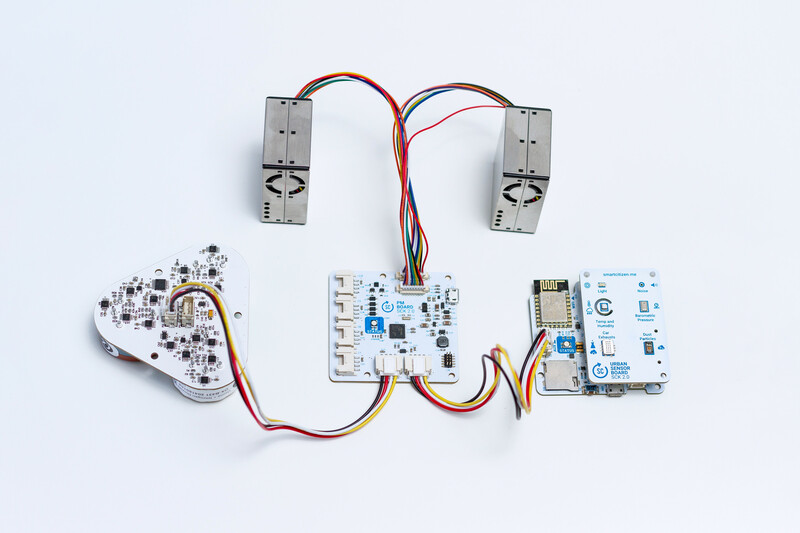 The Kit features a modular architecture where sensors can be updated independently by replacing any individual Sensor Board. 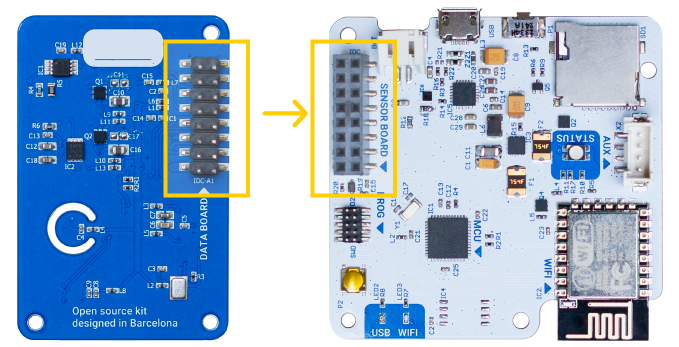 The Sensor Boards features GPIO, ADC, I2C, UART and I2S connections at 3.3V. Currently, we only offer the Urban Sensor Board, but more boards are on the way, and you can even design and build a custom one. The Data Board features and independent configurable auxiliary bus at 3.3V with a SEEED Grove connector. The Bus has native support for I2C, but it can also be setup on firmware as a GPIO or UART port. It can supply power up to 750mA, and it can be enabled or disabled by software. Example of devices connected via the AUX connector. The power infrastructure of the Smart Smart Citizen Kit 2.0 give us the possibility of running directly from a USB power source with or without lithium battery, it is composed by: * BQ24259 USB Charger that manages external power regulation, battery fast charging (up to 2Ah) and USB OTG that allow us powering other devices from the SCK. * BQ27426 Battery Fuel Gauge for precise battery level measuring. Normaly the SCK uses a 2000 mAh Lithium polymer battery but it is possible to take advantage of larger batteries. The charging current is regulated with a manual imposed limit that can be configured, and also auto adjusts to the connected USB charger capacity. The normal time for completely charging the stock battery is between 2 and 3 hours. It is also possible to use solar panel (5v) to charge the SCK. The power consumption of the kit depends on which sensors are enabled and how often they are read/published. Between readings the kit goes to sleep mode turning off almost all the subsystems and reducing the power consumption to almost nothing. The most problematic sensors in terms of power consumption are the MICS gas sensors (NO2 and CO) which needs an always-on heater with a permanent consumption of around 50 mAh (35 hours per charge) and the PM sensor which needs a fan with a consumption of 35 mAh (50 hours per charge). We are working on pulse modes for both sensors that will allow us to turn them on for short periods take a reading and turn them off instantly. Without those sensors enabled the SCK can operate around a month posting data to sdcard every minute with one charge of 2000 mAh. The kit will operate normally: read sensors, post, got to sleep. Until the battery charge is below 3% when that threshold is passed it will enter an emergency sleep mode and interrupt all the normal functions until the charge goes over 5%. Orange flash and normal led Behavior (blue or pink breath) - charge is under 15% connect the charger! 3 ultra fast red flashes and NO other color - charge is under 3% (emergency sleep) connect the charger!! NO readings are taken! !